Been awhile since I've sat down and gave you a shot of what's been going on in my paddle life. Took a little break. You can kind of blame it on mainland Mexico. Once you've been surfing down there in the middle of winter, you don't feel very fired up to jump right back into your normal, 54 degree Fahrenheit, surfing life. A good sign. A drying wetsuit hanging outside my bedroom door, sunshine and light winds- time to get back into the groove of surfing things. I guess you could also say I just needed a little time-out from paddling. I don't know about you but in anything I do, I reach a saturation point where it all starts to feel the same. I'd go for a surf, the waves would be kind of blah and I'd find myself getting stale, every turn kind of a mirror of the ten before it. When that starts happening I know it's time to back off and find new inspiration. Same thing happened to me here. I'd write a piece, post a pic... but the excitement and joy wasn't quite there. Don't be too gnarly on me- there have been over a thousand posts put up onto this site... almost all of them penned by yours truly. But, same story, I needed to take a little vacation for the site- get re-energized, refueled. Which is what happened today. Let me set the stage: sunny, high tide, building little southern hemi blip of a swell- just enough to put little crumbly, right and left wedges up onto the beach. Sometimes you just know in your guts that YOU ARE OUT THERE. There's no weighing the options, no teeter tottering back and forth about that lawn you have to mow... you don't even hesitate, you just react. Well, that was me. Nasty cold and all, I just bolted home. 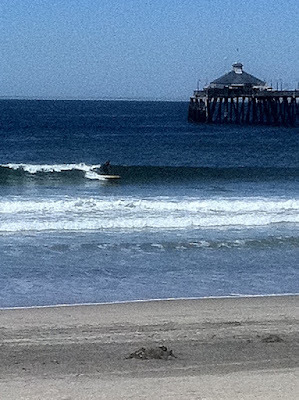 Grabbed the 9'0 x 29" Stamps Ninja Bump that I "borrowed/stole" from my buddy Steve and paddled out. Jeez did it feel good out there. Very small, really clean- dang fun. The board was the perfect choice, more of a longboard shape with all the Tim Stamps double barrel, hyper-turbodrive, bottom contours... kind of like a log on steroids wrapped in a K-car, I'm-just-here-to-get-the-groceries skin. You know, a board with that hot librarian kind of look. I surfed ten waves, carving bottom turns that zanged off the fin flex, stalling for the pocket and cross stepping it up to the nose. It felt like coming home. 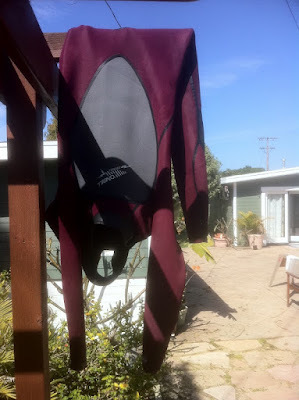 And thus the wettie, slowly drying in the court yard. Swinging in the wind. My surfing flag of victory. I'm definitely back. Save some waves for us. Jacky and I land in San Diego Tuesday afternoon. Neither of us have experienced a west coast wave before. Thanks Eric- stoked to be back and got some paddle adventures lined up so should have some good stuff coming! Yo NC Paddle Surfer- if you're in town for awhile and I can swing it, it'd be great to get a surf in. Drop me an email: john@paddlesurf.net might be a little cloudy for the next few days- keep your fingers crossed! Damn well said Anonymous, right on. Good for you John, sounds like you got some fun ones. Well said John-surf has been crap lately and i felt myself feeling the same way for a bit-its normal-gald tohear you had a good sesh that cleared out the cobwebs and washed the no surf funk off! 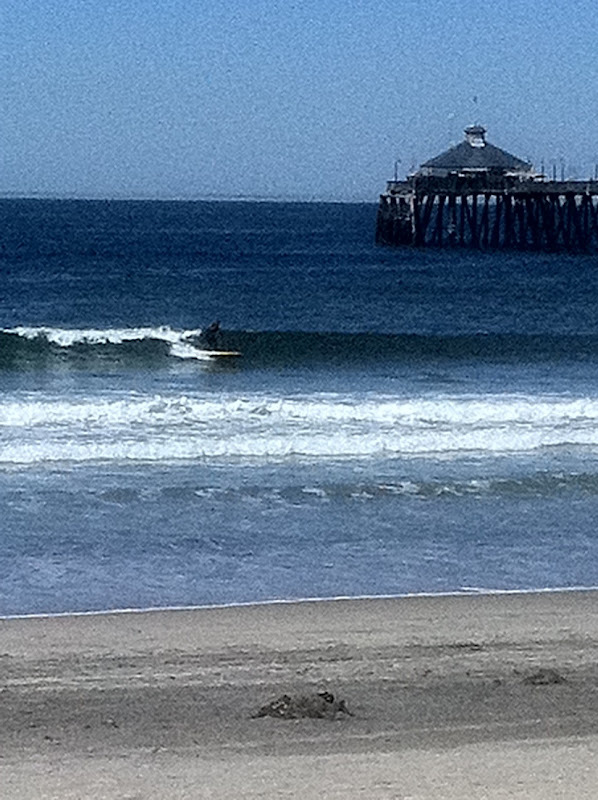 Dig the blog-keep it up and hope to see you in the water soon!